The English Springer Spaniel has a compact body, upstanding and with proud carriage. It has a docked tail. Its build suggests a combination of endurance, strength and agility. Very eager to please, the English Springer Spaniel makes a good family pet and working dog. Very affectionate, this dog breed loves everyone. The English Springer Spaniel originated in England. Male English Springer Spaniels range from 19 inches to 21 inches. Female English Springer Spaniels range from 18 inches to 20 inches. Male English Springer Spaniels range from 45 to 55 pounds. 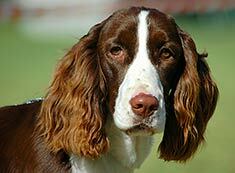 Female English Springer Spaniels range from 40-50 pounds. English Springer Spaniels are usually black, blue or liver and white. 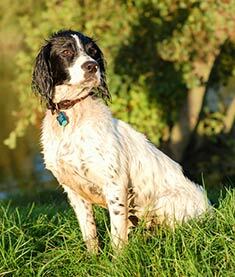 English Springer Spaniels have straight or partly wavy coats that are water resistant. Regular grooming is essential to keep the coat neat and clean. The English Springer Spaniel is energetic and friendly. An intelligent dog breed, they are easy to train. The English Springer Spaniel is susceptible to epilepsy, ear infections and eye abnormalities. The expected life span of the English Springer Spaniel is 10-14 years. English Springer Spaniels are energetic dogs who need daily exercise. This dog breed will do best in a house with a fenced yard. The English Springer Spaniel is in the Sporting group. Find English Springer Spaniel Puppies with our Free Breeder search!